With an estimated 38,000 California children suffering behavioral impacts from eating synthetic food dyes, a state senator hopes his bill will do what the federal government won’t. Should artificially colored foods carry warning labels about their potential impact on children’s behavior? California State Senator Bob Wieckowski thinks so. And he’s introduced a new bill (California SB 504) that would require warning labels on all food containing synthetic food dyes—including food sold in restaurants. If passed, it would be the first law of its kind on the state and federal level. Since 2008, the European Union has required warning labels on food containing six synthetic colors—FD&C Red #40, FD&C Yellow #5 and #6, plus three colors not used in the U.S.; the same food dyes are banned outright in the U.K. These policies were enacted in response to a 2007 study that found links between these dyes and behavior changes in children that include hyperactivity. Here, the FDA is referring to both the synthetic dyes—the FD&C colors made from petroleum or oil-based chemicals that require warning labels in Europe and would under SB 504—and colors, like annatto, made from plant extracts. But on another page of consumer information, the FDA says the science on synthetic food dyes “indicates that most children have no adverse effects” but that some children may be “sensitive” to them. It also says the FDA will continue to follow the science. Despite the lack of legal requirements to remove them, major food manufacturers, restaurant chains, and retailers have been steadily eliminating these colors. In the latest example, Dunkin’ Donuts and Baskin-Robbins announced on earlier this month that they would remove artificial colors from all products sold in the U.S. by the end of 2018, replacing them with “naturally sourced colorings.” Clearly, if Nestlé has taken synthetic colors out of their Smarties and Mars is pulling them from all its candies—including M&Ms—such a shift is possible. “This commitment doesn’t transform the nutritional quality of donuts or ice cream, but it is a commendable step in the right direction,” Michael Jacobson, executive director of the Center for Science in the Public Interest (CSPI), said in a statement. CSPI and the University of San Diego School of Law’s Children’s Advocacy Institute are co-sponsors of the California legislation. 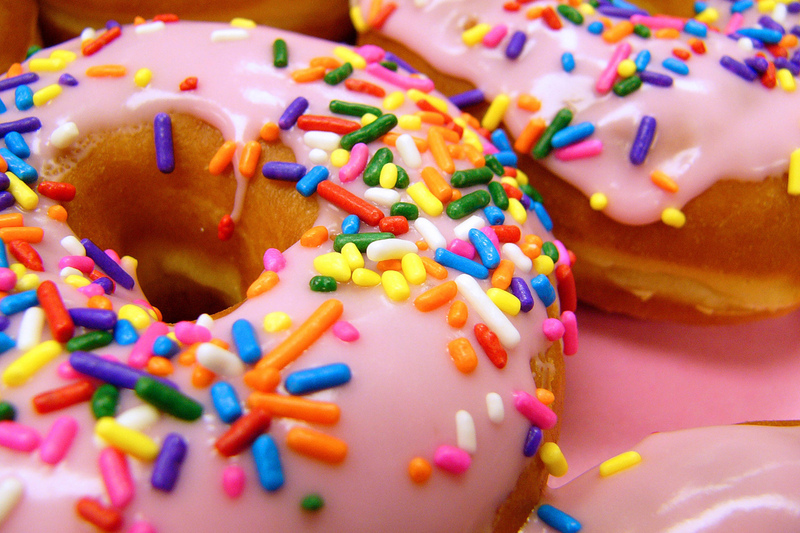 Dunkin’ Donuts and Baskin-Robbins join dozens of other companies that are phasing out synthetic dyes from at least some of their products. Although Kraft Heinz declined to answer questions about any additional plans to eliminate synthetic colors, the company no longer uses them in its signature macaroni and cheese products. With so many companies already moving in this direction, why did California introduce a bill? Scientists have been studying possible links between synthetic food colors and children’s hyperactivity since the 1970s. The bottom line is that about 8 percent of children’s attention deficit hyperactivity disorder (ADHD) symptoms may be connected to synthetic food dyes. And for some children—about 33 percent of children with ADHD—a diet without synthetic food colors may help relieve those symptoms. According to information drawn from the U.S. Centers for Disease Control and Prevention (CDC) and the U.S. Census, an estimated 38,600 children in California may be adversely affected by food dyes. And SB 504 puts the costs associated with the hyperactivity in California children triggered by food dyes at an estimated $560 to $820 million annually. “The growing consensus among these researchers is that… synthetic dyes don’t affect all kids, but those that it affects, it definitely affects.” said CSPI senior scientist Lisa Lefferts. While the Grocery Manufacturers Association (GMA) and Food Manufacturers Institute defer to the FDA’s assessment that the science isn’t conclusive, consumer demand for food free of these additives continues to grow. For instance, a 2016 International Food Information Council survey found that 38 percent of consumers are concerned about chemicals in food, up from 9 percent in 2011. As General Mills spokesperson Bridget Christenson put it, “We know that consumers are increasingly interested in the ingredients used in their food and want to see more recognizable and familiar ingredients on labels.” When it comes to replacements for synthetic colors, finding alternatives for blue dyes—which are also used to make white food look white—is apparently the most challenging. So some reformulations, like that for General Mills’ Trix cereal, are simply shifting to different hues. Ninety percent of General Mills cereals are now made without artificial colors. But as Jessica Almy, CSPI’s deputy director of nutrition policy, explained, “Many parents have no idea that hyperactivity can be triggered by food dyes.” And she pointed out, “This puts a lot of onus on parents,” having to read the fine print on every food label. Ingredients vary widely and a product from one brand may be free of synthetic dyes while another manufacturer’s version of the same item contains them. One of the issues for those concerned about synthetic food dye exposure is the lack of information about how much of it children are exposed to. According to scientists who’ve been measuring food for its artificial coloring contents, the amount varies widely and in some cases is surprisingly high compared to what FDA’s considers safe to eat in a day. And not accounted for in any nutrition or health guidelines are potential cumulative exposures for children who may eat many artificially colored foods in one day. “In the U.S., we have no system to know how much of anything is being used,” says Tom Neltner, Environmental Defense Fund (EDF) chemicals policy director. “If you don’t know how much is being used you can’t estimate exposure.” And while the FDA has set “acceptable daily intakes” for synthetic food dyes, food labels don’t indicate how much food coloring the product contains. The FDA records the quantity of synthetic colors it approves for use each quarter, but that information doesn’t say where those colors are being used. FDA data does, however, show that in the past 60 years, the amount of synthetic food coloring consumed has increased five-fold. The FDA has also conducted a food survey analyzing 600 products for synthetic dye contents and estimates of the amount consumed by children of various ages. Those results, published in 2016, showed the highest exposures were for Red #40 and Yellows #5 and #6 from breakfast cereal, juice drinks, soft drinks, and frozen deserts. Boys 13 to 18 ate the most dyed food, but two- to five-year-olds also appeared to be getting a steady diet of them. And even “healthy” snacks like dried fruit leathers were often found to contain these dyes, some at levels that could easily put a small child above FDA’s recommended daily limits for their weight. Wieckowski’s office said it will be a while before the first committee hearings on the bill. And none of the five food companies or two trade associations asked opted to comment on the legislation. That said, all are clearly aware of consumer demand for food made without artificial colors—and many are making those changes with apparent success. “Raising awareness through warning labels will educate parents about the adverse effects of food dye and empower them to make better-informed choices,” Wieckowski said in a statement. Donut photo CC-licensed by Michael Stern. If there are kids that are affected by dyes avoid them. Put them on the label to be transparent but don't generalize by saying it affects all kids and behaviors. There is enough "fashion" trends going to self support opinions that are in the world already. 17 organizations, including the Center for Food Safety, Consumers Union, Environmental Defense Fund, Natural Resources Defense Fund and Consumer Federation of America plus more than two dozen individual scientists and physicians have signed a letter supporting this California bill.